THE SECRET TO MY POPULAR MOIST BANANA BREAD IS REVEALED TODAY. BE CAREFUL WHAT YOU DO WITH THIS SWEET INFORMATION. In a perfect Nutella world we’d all love Nutella but for now you either love it or you hate it. 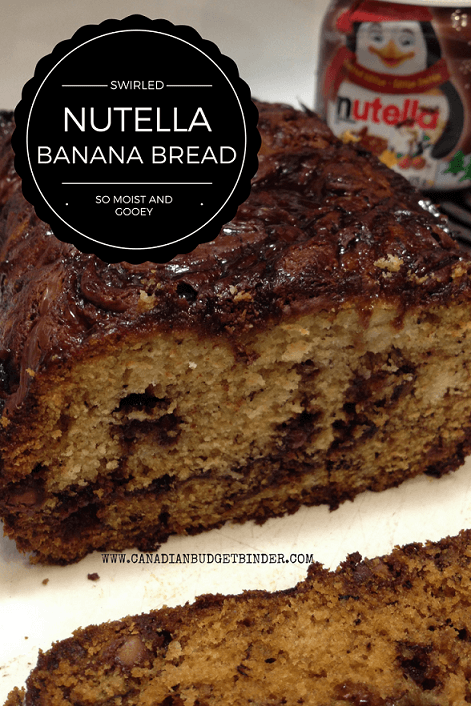 I’m going to Nutella bomb your kitchen today with a Nutella banana bread recipe like you’ve never tasted before. Creating recipes with Nutella seems pretty easy and it is because chocolate practically goes with everything, especially bananas. 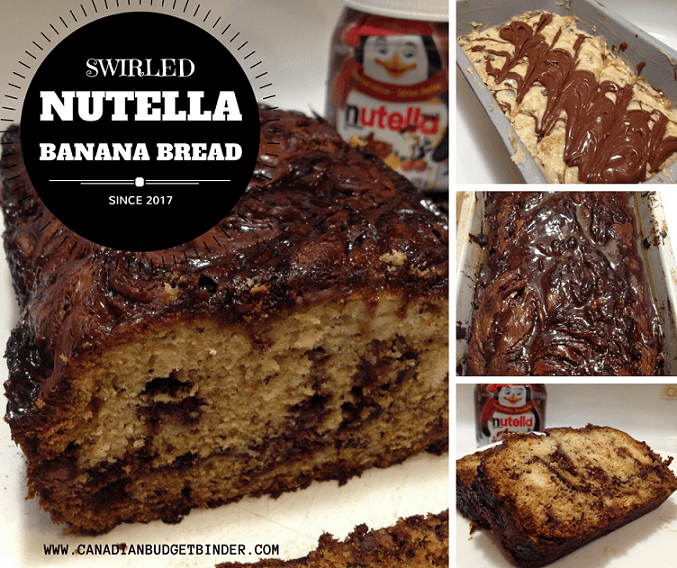 I may be biased but this is one of the best and moist Swirled Nutella Banana Bread recipes that has a bit of ooey-gooey at the top. I promise you’ll either be licking your lips or your fingers when no one is looking or grabbing another piece to mask those sticky fingers. All you need is a spoon…and maybe a slice of bread. Nutella has gotten a bad rap after consumer complaints about their nutritious breakfast advertising over the years but production is still going strong. Someone has to be buying it! This is chocolate folks and probably not the best breakfast but heck, everyone needs a little chocolate boost in the mornings some times. Years ago when we had Spanish students over for a home stay while they went to University they all requested Nutella. In Canada bagels and cream cheese seem to be the hot breakfast craze or a muffin but not in Europe. It’s chocolate, chocolate and more chocolate. Maybe some fruit. I remember one of our German students thought that Bagels and Cream Cheese were so good that she went out and stocked up at the grocery store. This is what she had for breakfast everyday. At the time Nutella was not part of our grocery list as neither Mrs. CBB and I ate it. Since we were getting paid to feed our Spanish student we brought her grocery shopping with us to show her around the grocery store. Sure enough Nutella was one of our pit-stops as we went up and down the aisles explaining food products in Canada and how to use coupons and flyers to save money. Honestly, she was amazed at how much we could save using a coupon. Remember these are just teenagers who come from very wealthy homes so getting a deal, isn’t so much a big deal. A large jar of Nutella can cost about $5.99 and up depending on whether it goes on sale or not. If you shop at Costco you can find double pack large jars of Nutella for a bulk price or even Walmart will carry this format. Recently the grocery store had Kraft peanut butter and the small jar of Nutella on sale for $1.88. You can probably get about 2 cups of Nutella out of the small jar so $1.88 seemed like a very reasonable price. Of course Mrs. CBB thought that since she grew up with parents who always had Nutella in the house that we should grab a jar. Worst case and she says this with the biggest smile on her face, “You can bake with it” and went on finishing up the grocery list. It was only a couple of weeks back when we opened the small Holiday jar of Nutella and put a bit on a spoon for our son to try. The verdict: He hated it. What? I know what you’re thinking. What kid doesn’t like Nutella? That would be our child. Guess what came next? That’s right, “Well you’ll have to just bake with it or toss it”, which I would never do. Worst case I bake something that I can bring to work and watch everyone go mad over in the staff floor kitchen. I’ve made a couple of banana bread recipes on this blog in the past years both of which are very popular and simple to make. Using Nutella in a banana bread recipe takes talent. Why? If you’re not careful your Nutella will turn into one large lump of chocolate in your Nutella banana bread although I’m sure that won’t stop anyone from eating it. As you can see from the photo after I gave the Nutella a quick 10-15 seconds in the microwave I stirred it good and then gently poured a line of Nutella across the Nutella banana bread batter. With a butter knife I created wings on each side of the Nutella hazelnut spread line gently to create a swirl like effect. A quick prayer before it went into the oven and the power of baking magic took over. This worked out perfect as you can tell the Nutella swirl on top of the Nutella Banana Bread is outstanding. This is one of those cakes you want to show off to your mates because you know they’ll be begging you for the recipe. I don’t mind, you can share it with them. 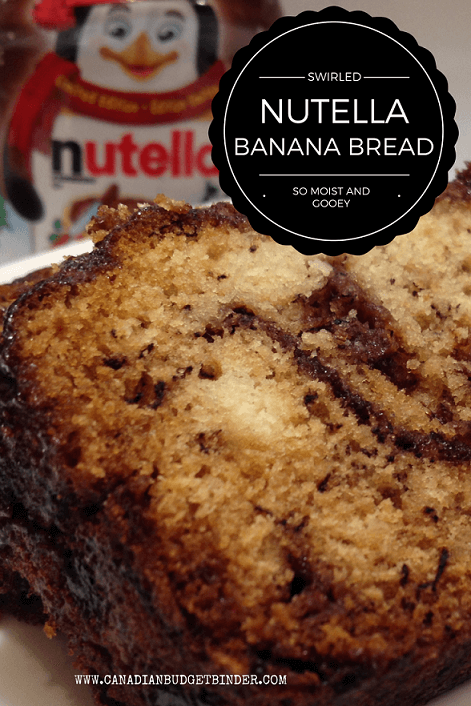 What makes this Nutella Banana Bread different from the rest? This is probably one of the questions I ask myself any time I read or create a recipe. I want my recipes to be unique so people are intrigued and want to try the recipe. I’m sure just about every baker reading this Nutella Banana Bread recipe today likes to bring something new and exciting to the table that people will swoon over. That’s me. No one likes a dry cake or muffin so it’s very important that you add enough fat to the recipe or liquid in the proper ratio to create a moist batter. The key to making this Swirled Nutella Banana Bread recipe moist is to use frozen ripe bananas. Yes, finally a banana bread recipe that calls for only frozen bananas because just about every freezer has a bag of them tucked away somewhere. We seem to keep adding to our freezer bag and it was time to get cracking on baking something with them. What you will need is minimum 4 ripe bananas that you peel and freezer for at least a day. Remove the frozen bananas and put the freezer bag or container in the refrigerator for defrost. This could take a day but that’s even better because what you’re looking for is all that lovely banana juice created by the ice in the banana. In a separate bowl remove the soft bananas and pour the beautiful banana flavoured liquid into a small pot with a 1/4 cup of water to start reducing on your stove top. After about 5 minutes add 2 tablespoons of Nutella and mix until you have a lovely sweet syrup-like consistency. The Nutella will act as your sugar that creates a Nutella Banana Simple Syrup. This my friends is your secret moisture blast that will saturate your Nutella Banana Bread and create a fork tender cake that you can also eat with your hands. Snack cake…that’s what I would call it. As soon as your Swirled Nutella Banana Bread comes out from the oven poke holes all over the top of the bread and pour half the reduced banana Nutella syrup all over to soak in. This recipe makes two standard loaf pans so you should have more than enough syrup. Our loaf pan size is 9.25″x 5.25″ or 23.5 x 13.5cm and if you don’t have this size it’s best to go bigger than smaller as explained in The Low-Down On Loaf Pans. The reason is to control any batter spilling over the rim. Let the cakes rest until they are completely cooled before you try to get them out of the loaf pans which is relatively simple. And that’s how it’s done. I do this with many cakes that I’ve made that are pound cake or loaf cake consistency in texture. One of my favourites is the Soaked Cherry Pound Cake or my Close to Starbucks Lemon Loaf But Better. 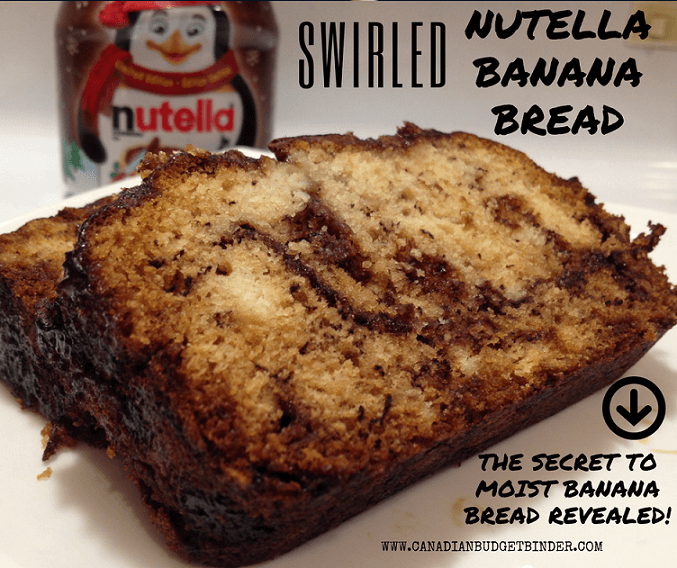 Get ready to WOW everyone with this amazingly moist Swirled Nutella Banana Bread recipe. 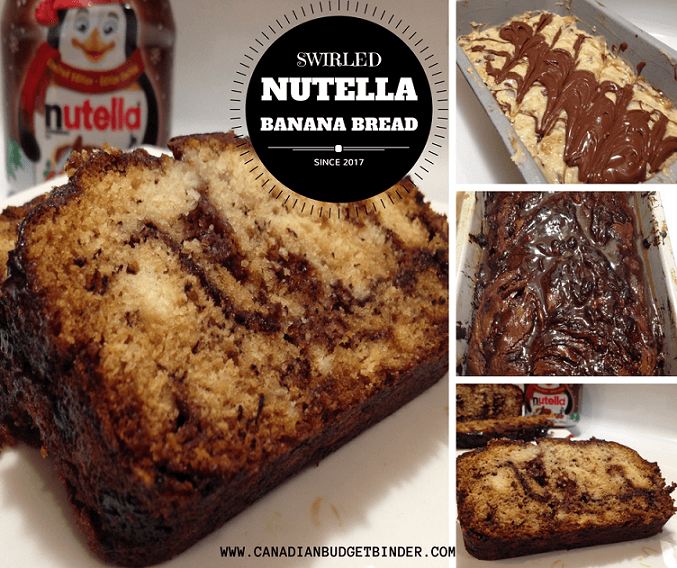 Just don't dream about Swirled Nutella Banana Bread, make it. The secret to moist banana bread is revealed in my recipe today. Using a butter knife create wings by pushing your knife from the center out towards the ridge of the pan. In the pot that you added your banana juice add the water, vanilla extract and Nutella then reduce on med/high until reduced a bit. Not much all you want is to combine the ingredients together. Have a taste. If you want to add more Nutella flavour that's up to you. Keep warm on stove until Banana loaf comes out from the oven. You need at least 2 cups of banana syrup. Pour half the Nutella Banana Syrup mixture over each Nutella Banana Loaf and let soak until the cake is completely cooled. Remove cakes from pan and serve with your beverage of choice. 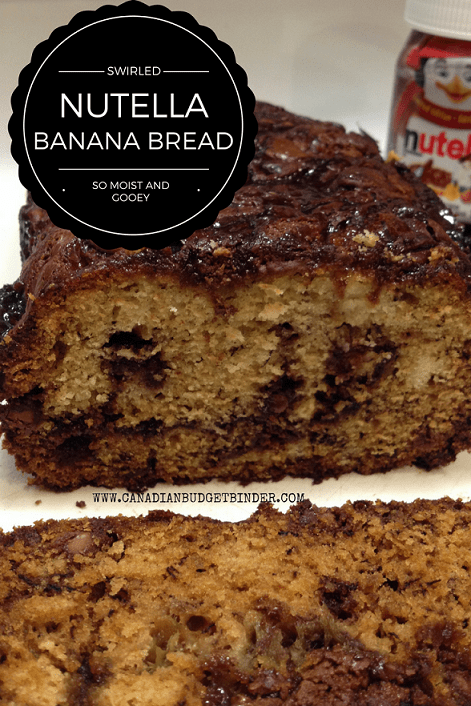 Once the Nutella Banana Bread cools you can slice it nice and thick and you’ll notice the pound cake consistency which Mrs. CBB and I both love. We wrapped our second loaf in tin-foil and put into a large freezer bag so we have it just in case company comes over. It’s always nice to have a cake to pull out of the freezer for those times when baking something before guests arrive isn’t part of the game plan. I will eat anything with Nutella, definitely going to try this. Go for it… You’ll love it. It’s so moist.